This first article traces some of the lesser known roots and branches of Yoga and how they weave into modern neuroscience and psychology, melding with integration science. The second article will review in more detail the research evidence for the broad-ranging benefits of Yoga to the body, mind, and spirit, gathered from diverse fields such as epigenetics, immunology, clinical psychotherapy, cardiovascular disease, multiple sclerosis research, aging, and mental health. The third paper will outline the framework the author has developed for Yoga as applied to neuroscience, illustrating with case studies drawn from her clients, students, and postgraduate yoga teacher trainees. Yoga is the art of navigating our internal world. Yoga’s insightful sophistication in choice of tools to navigate the mind’s devastating or blissful effects on well-being draws on the interrelationships between the heart, body, wisdom, spirituality, and the universe. This inner world of Yoga complements the neurosciences. In neuroscience the focus is the brain as a living organism with behavioral consequences. The field is fundamentally changing and enhancing our understanding and treatment of mental and physical disorders. have learnt to stop the flow of mighty rivers but do not know how to lessen the flow of our own thoughts? We have built an enormous knowledge base that has allowed us to locate the furthest galaxies, yet we cannot find our own quiet center or the door to lead us out of the darkness of depression. We do not know how to be still or how to manage our thoughts so that they do not intrude into our sleep, our relationships, our feelings, and our language. We manage our fear, anxiety, depression, and anger by suppression, or staying busy, or by denial. We are afraid of silence and stillness. We fill every moment of our time with streams of activities, keeping the mind continuously busy. Even what we call relaxation or leisure time involves activity of a mind kept busy. It is into this chaos of the inner mind that the technologies of Yoga can enter and hold their own. More than a somatic therapy, Yoga is a more than 4000-year-old experiential science of integration, a practical philosophy (darshana), a technology with a vast range of psychospiritual techniques, the aim of which is the integration and union of the self with the higher self, whatever that personally means to an individual. The key is gaining control of the mind in amongst the chaos and debris of thoughts, experiences, memories, and sensations, to connect to and re-merge with the light of one’s original source, the ever-present higher self. Recognizing that no two people are alike, Yoga has evolved a myriad of tools and multiple entry points for this integration process to suit the full range of individual temperaments. Ultimately, everyone has their own path, and in Yoga there is no one “correct” path to suit everyone. There is a steady growth both in the uptake of Yoga as a practice and of research into Yoga, with more and more people turning to these ancient practices for physical, mental, and spiritual well-being. Findings from research on modern postural yoga (the most familiar and simplified practice of Yoga) support the fundamental premise of ancient Yoga wisdom discovered through experiential knowledge—that Yoga impacts the whole person. Spanning more than four millennia, Yoga has been a fundamental component of Indian life, thought, study, research, and spirituality. By contrast, in the west, Yoga and meditation have only started to gain attention in recent decades, with rapid growth in research at universities and centers, programs in hospitals and care facilities, and collaboration with India. The last 10 years in particular have seen an exponential rise in the number of peer-reviewed publications on Yoga, spanning the fields of science, medicine, psychology, psychiatry, interdisciplinary studies, and other non-science fields. It was in the early 1960s that reports of studies on Indian “yogis” filtered into the west through science journal publications reporting measurements of extraordinary physical and mental feats (Wenger, Bagchi, & Anand, 1961). Trained at Yale in 1950, B. K. Anand, considered the founder of modern neurophysiology in India and specializing in the hypothalamic system, included in his research some investigations into the ability of yogis to voluntarily induce changes in heart rate and pulse, breath control, and electrical activity in the brain. (For a review of these studies published between 1961 and 1968, and of his wider 50 years of science contributions, see Mallick, 2001). This caught the interest of the western scientific community as new studies were just beginning to indicate that it might be possible to exhibit voluntary control over some aspects of the autonomic system, previously thought to be under involuntary control (Schwartz, Shapiro, & Tursky, 1971). Active scientific interest in yoga and meditation continued during the next decade (Shapiro, 1985) and expanded into Buddhist techniques, and it was one of the latter that Harvard University’s cardiologist Herbert Benson and colleagues studied, measuring the stress-reduction effects of meditation (Beary & Benson, 1974). Credited with bringing spirituality and healing to western medicine, Benson changed the ancient terminology of “meditation” into what he called “the scientific name for meditation”, coining the term relaxation response, as well as helping to popularize the term “mindfulness” (Benson, Greenwood, & Klemchuk, 1975; Benson & Klipper, 1975/2001), which is now used in a wide range of therapeutic settings, usually divorced from its origins within the much broader spiritual practices of Yoga originating in India and Tibet. The Benson-Henry Institute for Mind–Body Medicine at Massachusetts General Hospital was established in 2006, and subsequently Harvard University set up six more centers: a functional neuroimaging laboratory; cognitive, affective, and contemplative neurosciences; the Lazar Lab; the neuroscience of meditation, healing and sense of touch; the Osher Center for Integrative Medicine; the Khalsa Lab on Yoga Research; and Ellen Langer’s Lab. These and other centers around the world are driving the critical mass needed for the expansion of research in this field. Due to the involvement of all the dimensions of the person (the mind, breath, and spirituality as well as the body), a greater reduction in the stress response is observed for yoga compared to gym exercise (Govindaraj, Karmani, Varambally, & Gangadhar, 2016; Sengupta, 2012). Stress reduction is not just limited to slowing the heart rate and breath, but induces changes on all levels, including expression of chronic stress-related genes (Buric, Farias, Jong, Mee, & Brazil, 2017). Yoga changes brain structure and function; for example, enhanced executive function has been identified in older yoga practitioners compared with a control group who only did stretches and strengthening exercises (Gothe, Kramer, & McAuley, 2014). Eight to 16 weeks of yoga is sufficient to facilitate these remarkable changes in the brain and body. Most of the published research is based on participants attending a general yoga class. Specialised yoga classes for specific conditions in most cases are not needed to gain improvements. Awareness of stress is growing worldwide, but the recognition that stress can have a detrimental effect on health is not new. There have been publications during at least the last 40 years connecting stress to health. In the 1970s, stress was known to have a major role in cardiovascular disease, cancer, arthritis, and respiratory disease (Pelletier, 1977), and in the 1980s it was estimated that between 50% and 80% of visits to the doctor stemmed from stress-related conditions (Cummings & VandenBos, 1981; Shapiro, 1985). In this decade, specific forms of stress with acute health consequences are rising: an analysis of the World Health Organization Global Burden of Disease Study 2013 (Whiteford, 2015) estimated that mental, neurological, and substance use disorders were the leading cause of years lived with disability worldwide; see also Whiteford et al. (2013). Stress intrudes into almost every aspect of our health, affecting the immune system and contributing to gastrointestinal disorders, excessive weight disorders, mental health disorders (including depression, anxiety, schizophrenia, autism, trauma), autoimmune disorders, insomnia, cardiovascular disease, cancer, chronic pain, ageing, dementia, Alzheimer’s disease, asthma, fibromyalgia, and the list goes on. Reducing the stress response, even for a short time, can relieve some of the detrimental effects of stress involving changes at the level of the brain structure itself—such as shrinking the hippocampus (memory impairments), increasing the size of the amygdala (raising levels of fear and anxiety), and decreasing blood flow to the prefrontal cortex (executive function impairment). These effects extend into the body, affecting every aspect of health. Chronically elevated sympathetic nervous system (SNS) responses trigger the hypothalamus–pituitary–adrenaline (HPA) axis and the subsequent circulation of chemicals, hormones, and neurotransmitters like cortisol and adrenaline throughout the body. A focus on reducing stress consequently results in a cascade of benefits on numerous physical and mental health disorders, even when these are not specifically targeted. My aim in Yoga is to give my students and clients a rest from their ever-active mind and elevated SNS. They call it a feel-good experience. I know their minds and nervous systems have indeed had some time out because of the visible effects in their faces and bodies. Allowing the parasympathetic nervous system (PNS) to activate a little more to balance out the autonomic nervous system is reinforced with dopamine release. When that feel-good dose is repeated weekly, or preferably two or three times a week, new physical patterns begin to surface over time, with corresponding changes in their mental habits. Regular yoga experiences extend these changes into their daily lives. In Samkhya philosophy, the mind has three principle aspects: buddhi, the higher wisdom; ahamkara or ego, the “I” that separates us from our source; and manas, coordinating senses, action, emotion, sensation, and imagination. A primary cause of spiritual, physical, and mental disorders is the inability to hold on to the buddhi, leading to poor judgement, wrong values, and false beliefs. In Tantra there are additional levels. These are the ability to create, maintain, and dissolve our thoughts and actions. Between the dissolution stage and the creation of the next thought there is the opportunity for grace or concealment, but most of us move from thought to thought without pause; grace eludes us, and we continue in a thought loop. Without adding regular pauses and stillness into our lives, grace will continue to elude us, being replaced by a false sense of separation, the concealment of what is always present within us. In Balinese Yoga, there is no separation between the heart and the mind. Every moment presents choices for us. Each of these choices results in an experience that might leave an impression. Stronger experiences, particularly negative ones, leave a stronger imprint. In neuroscience and physiology terms our brain structure is changed by the experience. Cascading changes throughout the body affect the function of heart and gut, and vice-versa. This shifts the breath and changes gene expression. Experiences become consolidated into different layers in our memories. Procedural memory (our “auto-pilot”) is modified by our experiences and is expressed in our automatic responses and in our bodies. Therefore, the choices we make will shape who we are and who we will become. These experiences influence our next choices, and when repeated, begin to create patterns of choices. Unless cleared in some way, our impressions from these experiences—samskaras—accumulate over a lifetime and build habits and behaviors that are now below conscious control. These habits and behaviors continue to shape our personality, our thought patterns, our responses to internal and external stimuli, our physical appearance, our mental health, our body’s health, our self-identification, our beliefs and values, our social connections, our surroundings, and hence the society and world we create. If we stay trapped in thoughts and emotions of anger, resentment or frustration, then in Yoga terms we will attract similar prana (or energies) like a magnet and increase our sense of isolation and separation from our higher self, which is the ego part of the mind. In neuroscience terms, we make neural connections that reinforce the pathways to these thoughts and responses, and hence they become the first go-to response pattern when stimulated. These neural patterns are formed via Hebb’s axiom—neurons that fire together, wire together (Hebb, 1949)—and have a physiological and chemical effect on our breath, pulse rate, blood pressure, gut microbiome, muscular tension, sensitivity to pain, and immune response and extend into every aspect of our physical and mental health. Lastly, our mind becomes more prone to fear and anxiety, the loop continues, and our body and brain are re-shaped. There are a number of Yoga techniques that can act as an antidote to this process and clean out an onion-like layer of accumulated samskaras and karmic debris. The most accessible of these include stillness practices, meditation, authentic actions carried out with no attachment to the results, devotion to a symbol of your higher self, and breath. There are, in addition, a range of techniques in Yoga that are specifically for changing memories. Because our mind is constantly creating thoughts, processing sensory and motor input, drawing on memories and the emotions, it is in constant flux. Those aspects of ourselves that change are therefore unreliable (because they might change again), and we can lose sight of our stable discerning center, the unchanging witness state. These techniques are based on recalling a memory or thought and then dissolving it in various ways. This process is somewhat similar to memory reconsolidation, which requires reactivation of a memory to place it into a labile state in order to make it open to change or deletion. Hence, just like in Yoga, memory systems are thought to be flexible, adapting to our behaviors and acting out at the level of cognition, and likely to have a metaplastic nature (Nader, Hardt, Einarsson, & Finnie, 2013). Yoga is a multifaceted intervention. It is a self-regulated pharmacy practice, with the ability to shift the biochemical make-up, neurotransmitter balance, microbes, electric fields, and more. It also uses movement, stillness, imagery, mind, breath, and intention to produce specific kinesthetic and emotional states, as well as physical changes. Yoga has a vast history spanning at least four millennia, and a much older oral tradition. It is not easy to define as its original roots have extended much further and more widely than is popularly perceived. 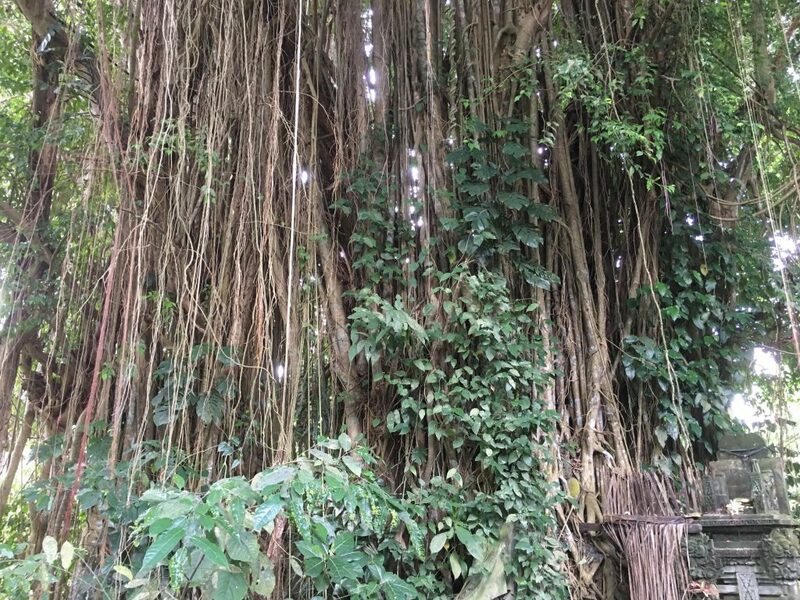 Like the banyan tree (Figure 1), Yoga’s “trunk” is one of India’s six major ancient darshanas (a darshana is a philosophy, or rather a particular “view”) that has developed multiple shoots and roots that have entwined and interpenetrated with others.These have evolved over the centuries through the accumulation of embodied experiential evidence and the application of scientific rigor in the methodology of enquiry. There are connections with the Vedas, the ancient Sanskrit texts that date from the very beginning of Indian culture. Yoga is the inner science, the experiential knowledge of the highest level of interconnectivity between humans, the universe, and the all-pervading consciousness, with multiple paths, techniques, and technologies. Yoga is mentioned throughout the evolution of Indian philosophy, including Buddhism and Jainism, and other branches that originated around 500 BCE. The early centuries of the Common Era saw the emergence of the dualist philosophy of Samkhya, another of the six darshanas. A follower of the Samkhya, Pataňjali, compiled the Yoga Sutras within the Yoga Darshana before 400 CE. At the turn of the first millennium of the Common Era, the non-dualist philosophies of Vedanta and the cross-pollination between Shaivism and Buddhism emerged. By the 8th century Vedanta was refined, and four paths of Yoga were outlined: Karma Yoga (action), Jnana Yoga (knowledge), Bhakti Yoga (love and devotion), and Raja Yoga (involving meditation). The period 300–1300 CE saw the emergence from Shaivism/Buddhism of Tantra spirituality, bringing in the feminine principle, Shakti: “If there is only the one Self, why should there be such a struggle involved in realizing it? In other words, why do we have to think of the world, and thus the mind–body, as an enemy that has to be overcome?” (Feuerstein, 2008, p. 341). Union with the higher self can be realized through the body and even within all things manifest, because everything is Shiva/Shakti. The co-development of Tantra in both Indian Darshana and Buddhist schools resulted in a strong overlap between the two, particularly Vajrayana and Mahayana Buddhism. Tantra was flourishing in India by the 8th century, and Buddhist Tantra expanded into Tibet, China and South–East Asia, including Indonesia. The Hindu–Buddhist fusion still exists today in Bali. Tantra gave rise to Hatha Yoga around 1400–1600 CE, with a possible merging of Hatha and Raja Yogas. The Yoga practices reported by British colonials highlighted the more spectacular aspects of the minor branch of “left-handed” Hatha yogis, whose practices included the breaking of societal taboos to challenge their spiritual strength. Vivekananda is credited with bringing Yoga to the attention of the west when he represented India at the first Parliament of the World’s Religions, held in Chicago, IL, in 1893. With the growth in popularity of physical fitness early last century, coupled with a growing interest in India by Europeans and Americans, Hatha was revived and further physical postures were created combining gymnastics with entertainment. This forms the basis of today’s most popular form of Yoga in the west, called modern postural yoga (Singleton, 2010), which is now influencing even India’s perception of Yoga. The definition of yoga from the Sanskrit means “uniting, or yoking, the self to the higher self”. The goal of integrating all the parts of oneself into a wholeness parallels at some level the actualization stage in Rossouw’s integrated neuropsychotherapy model (Rossouw, 2016), and further incorporates the spiritual and universal connection. The uniting capability of Yoga can be achieved by choosing from the enormous range of techniques that have been developed over centuries to suit different personality types and needs. The goal of all these techniques is to integrate the different facets of a person into a single wholeness by first taming the mind. The ability to tame the mind unfolds by developing the skill of equanimity, letting go of attachment to the outcome of one’s actions (bhagavadgita), or from yogascittavrttinirodhah (“containing the fluctuations of the mind”; Yoga Sutras 1.2). Citta (“the mind”) comprises all the complexities of memory, habits, behaviors and thoughts, and its fluctuations are the root cause of human unhappiness. Hatha. The physical and hence the bodily practices of Hatha Yoga, which is built on Tantra elements incorporating energy and breath work, mantras and mudras, physical postures and cleansing techniques. Jnana. If one is inclined toward knowledge and intellect, then Jnana Yoga is appropriate. Karma. The path of action is Karma Yoga, which stresses that the importance of doing what is right for the individual, and to not be attached to the result. Raja. Raja Yoga has an emphasis on meditation. Bhakti. For those who find joy in devotional practices such as kirtan, prayer, or group chanting of mantras, Bhakti Yoga is the path. Hatha Yoga, with its physical postures and Tantra energy focus, is most associated with the word “yoga”. In today’s world, the emphasis has shifted primarily to the asanas (“postures”) stemming from the creative period at the beginning of last century as already mentioned. There are numerous popular styles of Hatha Yoga, such as Integral (merging of all Yogas including the non-Hatha Yogas), Iyengar (static, alignment emphasis), Ashtanga (energetic and repetitive), Vinyasa (flow), and Kundalini (energy based). Each has its own emphasis and variation of approach, but they are all Hatha Yoga. If you are using postures and body connections, you are doing Yoga regardless of branding. Prana and pranayama: specific breathing techniques to control the flow of energy and fluctuations. Some of these have migrated into psychotherapy, where breath is used as a grounding tool to bring the client back into the present and circumvent the stress response. Dhyana and dharana: meditation and mindfulness technologies, which have migrated into psychotherapy. Taken out of the context of Yoga, these have been renamed as body rotation or body relaxation, mindfulness, visualization, or a resourcing tool. Kundalini, chakras, and nadis: disciplines relating to energy flow. Mantra: the use of sound and vibration for well-being. There are noteworthy parallels between a Yoga technique called bhramari pranayama, which can induce a deep mental relaxation thought to be caused by stimulation of the vagus nerve by the cranial vibrations from the sound, and the use of transcutaneous vagal nerve stimulation with electrodes for cluster headaches, epilepsy, and treatment-resistant major depression (see, e.g., Sackeim et al., 2001). Asana: specific physical postures that build strength and flexibility, massage organs and endocrine systems, increase circulatory systems, re-balance blood pressure and heart rate, and change gravitational orientation. Integrating mind, body, and breath is what sets Hatha Yoga apart from exercise. The western popularity of Pataňjali’s Yoga Sutras as the source for the meaning of Yoga is based on the dualist Samkhya philosophy. Pataňjali’s Yoga Sutras are indeed an important and profound contribution and have been extensively used in the science and psychology literature; see, for example, Kathryn Rossi’s interesting insights into neuroscience, Buddhism, and Pataňjali’s 8 Limbs of Yoga (Rossi, 2018). The Yoga Sutras are a compilation, drawn from various ancient texts and teachings available at the time, pertaining to wisdom and practical ways to quieten the mind to find union with one’s own sense of the divine. Within the much broader span of works written on Yoga over millennia, the Sutras are only one part of a much larger body of knowledge encompassing the wisdom and practices of Yoga. Regardless of their place in history—if the path resonates, then follow it, as all paths lead to the same absolute reality. What we think and feel, the memories and behavioral patterns that have become etched into us, are all reflected in the breath and the body. We read the state of ease or unease in a friend or relative through their physical demeanor—in the way they hold their body with ease or tension. How our mental state manifests in the body is now being understood at the molecular level. The instant we feel anger, frustration, or fear, we have triggered the HPA system, which links to the sympathetic system and has a cascading effect on our whole physiology before we have even consciously registered our response. The classic fight–flight reaction to our thoughts and experiences shape our mind and our body, including changes in physiology, posture, breathing pattern, immune-system activation, proprioception, chemistry, digestion, the nervous and circulatory systems, and the musculoskeletal system. All these responses leave visible markers in our physical bearing, bodies, and appearance. Yoga’s foundation is the knowledge that we are integrated beings. The mind affects our body and the body affects our mind. The body can become a very powerful tool when we get stuck in mind loops. Sensations, reflexes, injury, pain, physical restrictions, breathing, movement, and food all affect our mental state. As multi-dimensional beings we have a need to integrate the different parts of ourselves in order to create a sense of the wholeness of “me”. One particular Yoga path suggests that at our center is the spark of divinity, the atman, our spiritual reality. According to the yogic view, as described by Vivekananda (2005), a person is a spiritual entity who uses the body–mind as a vehicle for interacting in the material world. The meaning of the terms divinity and spiritual are unique for each individual. The “body–mind vehicle” can be thought of in Yoga as part of the layers, or sheaths, around this spark of divinity at our center, the number of layers varying according to a Yoga philosophy path. One commonly used model is the panchamaya koshas, the five-sheath model, illustrated in Figure 2. Figure 2. 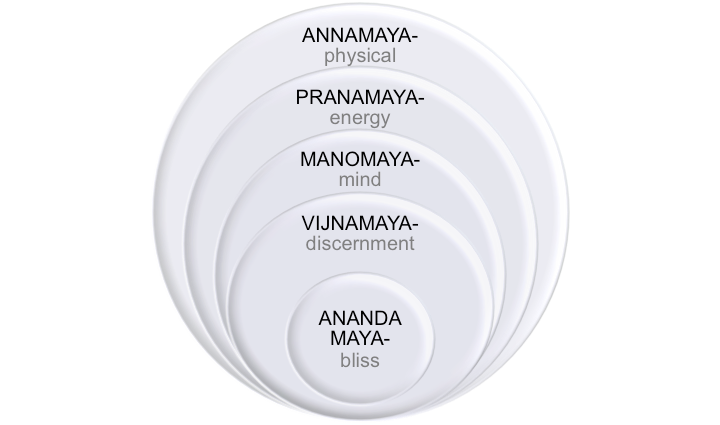 Yoga’s panchmaya kosha model (five sheaths or layers) that comprise the human. The key to all the models is that the sheaths or layers are all interconnected, and any disturbance or rebalance in one layer will ripple through all the layers. For example, for people stuck within their emotional barriers, movement (anamaya kosha) and breath (accessing pranamaya kosha) can be used to create changes in the mind layer (manomaya kosha), rather than confronting these barriers head-on. For Yoga, this attention to somatic sensations in psychotherapy and other somatic interventions in therapy is based on the kosha model. Table 1 describes the characteristics of the five koshas. Because specific koshas can be influenced by different Yoga tools, there is a large range of choices that can be tailored as appropriate to the needs of the individual. Shifting our awareness to the physical self (such as feeling the sensations of touching a chair or the breath) changes our physiology, which ripples through to our mental state. This interconnection between mind and body has been recognized by talking therapies as a powerful tool to bring clients back into the present moment and short-circuit a fall back into the default mode. Yoga techniques such as somatic sensation and movement, breath attention and control, and mindfulness and meditation techniques are now generally utilized in talking therapies. The integration of the mind, body, and breath in Yoga act in unison rather than as separate parts and develop the skills of interoception (the ability to feel subtle signals from the body) and proprioception (feeling our position in space). Our culture is increasingly “head-heavy”, and there is a disconnect from the body. The simplest moves for beginners in Yoga, such as placing an arm or a leg in a different position to their habitual posture, requires re-learning the skill of feeling. In psychotherapy this yogic body–awareness technique is called resourcing, that is, keeping a client in the present. Bringing attention to the contact between the body and the chair anchors the client into the present and prevents a re-living of a trauma. Pat Ogden’s use of this kind of somatic vocabulary makes use of resourcing in her sensorimotor psychotherapy approach (Ogden & Minton, 2000). Having a balance between all koshas is a key to well-being. Two other pioneers in this recognition of the role of the body in psychological disorders are Bessel van der Kolk and Peter Levine. Van der Kolk’s pioneering work in understanding the psychobiology of stress broke new ground with the concept that “the body keeps the score”, or “stores” the effects of past trauma (van der Kolk, 1994), while Levine’s somatic experiencing approach works with “completing” unresolved and incomplete physical residues left by a traumatic event (Levine & Kline, 2012). Pranayama, or breath modulation, is used in Yoga to change a mental and physical state. The breath affects the physiology and biochemistry of the body and mind. Emphasizing long exhalations are the key to activating the PNS and dampening the SNS response to stress; this process is not merely “taking a deep breath”, as will be explained in more detail in Part 2 of this series. Breath modulation and awareness has become a standard technique in talking therapies to short-circuit anxiety, fear, and other stress responses. Mindfulness is also used, but it is not suitable for everyone, and can reactivate traumas. A dharana practice is an alternative to mindfulness and develops the skill of being able to redirect a person’s mind to where they want it to be. 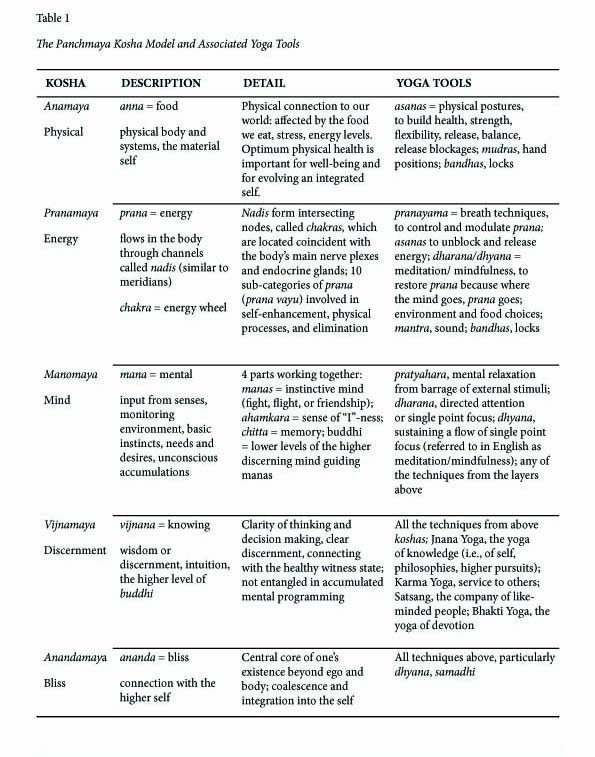 This brief and simplified overview might provide some context to the next yoga class or mindfulness session and also insight into how the influence of Yoga on all our systems stems from its role in being able to alleviate and dampen the stress response. The inner world of the mind is a lifetime’s work in progress, but the light of Yoga can illuminate the clarity we all hold within. In the next article in this series the effect of Yoga on telomeres, epigenetics, linkages between sperm quality and childhood cancer, and brain volume changes will be explored. Beary, J. F., & Benson, H. (1974). A simple psychophysiologic technique which elicits the hypometabolic changes of the relaxation response. Psychosomatic Medicine, 36(2), 115–120. Cummings, N, & VandenBos, G. (1981). The twenty years Kaiser Permanente experience with psychotherapy and medical utilization: Implications for national health policy and national health insurance. Health Policy Quarterly, 1(2), 159–175. Feuerstein, G. (2008). The yoga tradition: Its history, literature, philosophy and practice (3rd ed.). Prescott, AZ: Hohm Press. Hebb, D. O. (1949). The organization of behavior: A neuropsychological approach. New York, NY: Wiley. Levine, P. A., & Kline, M. (2012). Use of somatic experiencing principles as a PTSD prevention tool for children and teens during the acute stress phase following an overwhelming event. In V. Ardino (Ed. ), Post‐traumatic syndromes in childhood and adolescence: A handbook of research and practice (pp. 273–295). Chichester, United Kingdom: Wiley. Nader, K., Hardt, O., Einarsson, E. Ö., & Finnie, P. S. (2013). The dynamic nature of memory. In C. M. Alberini (Ed. ), Memory reconsolidation (pp. 15–41). New York, NY: Academic Press. Pelletier, K. R. (1977). Mind as healer, mind as slayer: A holistic approach to preventing stress disorders. Oxford, United Kingdom: Dell. Rossi, K. (2018, October). The yoga of creative consciousness and cognition in neuropsychotherapy. The Neuropsychotherapist, 6, 21–40. Sackeim, H. A., Keilp, J. G., Rush, A. J., George, M. S., Marangell, L. B., Dormer, J. S., . . . Zboyan, H. (2001). The effects of vagus-nerve stimulation on cognitive performance in patients with treatment-resistant depression. Neuropsychiatry, Neuropsychology, and Behavioral Neurology, 14, 53–62. Sengupta, P. (2012). Health impacts of Yoga and Pranayama: A state-of-the art review. International Journal of Preventive Medicine, 3(7), 444–458. Singleton, M. (2010). Yoga body: The origins of modern posture practice. New York, NY: Oxford University Press. Schwartz, G. E., Shapiro, D., & Tursky, B. (1971). Learned control of cardiovascular integration in man through operant conditioning. Psychosomatic Medicine, 33(1), 57–62. Shapiro. D. H., Jr. (1985). Meditation and Behavioural Medicine: Application of a Self-regulation Strategy to the Clinical Management of Stress. In Burchfield, S. R. (Ed.) Stress: Psychological and Physiological Interactions (pp. 307–328). Washington, DC: Hemisphere Publishing Corporation. Van der Kolk, B. (1994). The body keeps the score: Memory and the evolving psychobiology of posttraumatic stress. Harvard Review of Psychiatry, 1(5), 253–265. Vivekananda, R. (2005). Practical yoga psychology. Munger, Bihar, India: Yoga Publications Trust. Whiteford, H. (2015). Updated estimates of burden due to mental and substance use disorders from the Global Burden of Disease Study 2013. Journal of Mental Health Policy and Economics, 18. 1 Capitalized “Yoga” refers to Yoga in the broadest and original sense, in contrast to its subset of modern postural yoga focused on the physical asana practice that most people associate with the word (Singleton, 2010). This latter subset of Yoga is referred to as “yoga”. Both include mindfulness and meditation practices. 2 A quick search of “yoga” on PubMed in November 2018 resulted in more than 4,700 publications. 4 “Self” is whatever has meaning at a personal level for an individual.